← Catching Waves with Christ! I don’t know if you noticed it, but today and for the last two weeks our Epistle reading has come from 1 Corinthians. That’s One Corinthians, by the way, not Two Corinthians. I haven’t preached on these texts, having preached instead on the Holy Gospel readings from John and Luke, respectively. 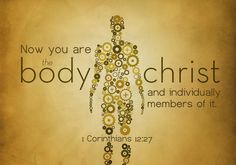 But today I think I will preach on these 1 Corinthians readings, taking all three of them together. I’ve been saving them up for today, because today we have our annual voters’ meeting to elect new officers, and these texts are a perfect fit for the occasion. That’s what St. Paul is saying here in our text. God has been at work in you, to lead you to faith in Christ Jesus your Lord. This happens through the ministry of the gospel, the good news of what God has done for us in our Savior, Jesus Christ. In your baptism, the Holy Spirit created in you the gift of faith, and since then, the Spirit has been nourishing your faith, through preaching and teaching and receiving the Sacrament. This is how the Spirit works, through the means of grace, to build you up in your most holy faith. Apart from this ministry of the Spirit, you would have no faith, you would not know Christ, and you would still be stuck in your sins. “You know that when you were pagans you were led astray to mute idols, however you were led.” That’s where we all would be, if the Spirit had not gifted us with faith in Christ. We would be lost in the dark, separated from God, worshiping false gods, and lost in our sins, under God’s judgment and condemnation. But Christ came, the Savior sent from heaven, and he rescued us, saved us, by his sacrificial death on the cross and his victorious resurrection from the dead. Jesus is Lord! He has conquered our enemies for us! Sin, death, devil, hell, the grave–all defeated, by our Lord and Savior Jesus Christ! Now we have forgiveness, life, and everlasting salvation, all because of what Jesus has done for us, purely out of his righteousness and goodness. And then the Spirit comes and preaches Christ to us. The Spirit works this faith in us, so that we trust in Jesus for our salvation, and not in ourselves. Thanks be to God! And the Spirit also brings us into this community of faith called the church. 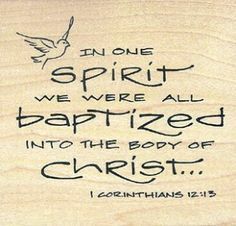 “For in one Spirit we were all baptized into one body.” Yes, you were baptized into the body of Christ. This is the family of God, a family of mutual support and edification, called together to build up one another, to care for one another, to love one another. This is the people of God on a mission in the world, a mission from God, to shine forth the light of Christ into this sin-darkened world, both here at home and around the world. What about your feet and your hands? Is there a fellow church member who could use a hand, literally? Someone who isn’t as able to get around and do things as they used to be? Maybe they could use a ride somewhere, or someone to run an errand for them? Or someone who would like a visit and have someone to talk to? Or have someone who could bring a meal over? The love of Christ, demonstrated in acts of kindness: That’s what happens in the body of Christ, in our life together. Then there’s our life together right here within the workings of the congregation. The various offices and positions of responsibility that need to be taken care of. President, vice-president, secretary, treasurer, elders, trustees, stewardship–many positions that need people to fill them. And there are many tasks that need people to do them. There are bathrooms to be cleaned. Trash to be taken out. Candles to be filled. Altar paraments to be changed. Communion vessels to be prepared and brought up, each week. All of these things I’ve just mentioned–clean-up, altar guild–the people who have been doing these could use some help. These things are not glamorous, but they are valuable avenues of service. How about you? Can you help? Talk to me after the service, and I’ll point you in the right direction. Now all of this needs to be coated and saturated with love. Love is like the lubricant that keeps the parts of the body fluid and functioning smoothly. Otherwise, without love, at the joints, the bones will rub against one another and there will be friction. We don’t need that. It’s hard enough being a Christian congregation in a world and a culture that is hostile to Christianity. We don’t need the church fighting within itself, biting and devouring one another, and spreading negative talk. That only weighs us down and dispirits us. It is not helpful. Constructive criticism, yes, wrapped in love. But tearing down one another and tearing down our congregation, no. All of us must examine our hearts and the use of our tongue, confess our sins, repent, receive God’s forgiveness, and ask God’s help to do better. “Love is patient and kind; love does not envy or boast; it is not arrogant or rude. It does not insist on its own way; it is not irritable or resentful; it does not rejoice at wrongdoing, but rejoices with the truth. 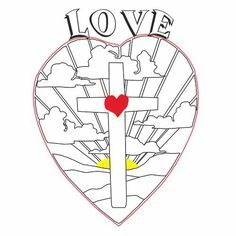 Love bears all things, believes all things, hopes all things, endures all things.” Brothers and sisters in Christ, we know what love is. We have received it from God, in the salvation given us in Jesus Christ. “For God so loved the world that he gave his one and only Son.” And the Spirit implants this love in our hearts, so we know it. The Spirit likewise gives us a loving heart, so that we come together as church: a people united in the faith; a people with a purpose in this world; a people with a hope, the sure hope of everlasting life together with our Savior and with all of God’s people forever. Let us pray: Dear Lord, help us–each one of us, and all of us together–to live together in love as your congregation. Help us to see the member in need, who could use an encouraging word or a practical assist. Help us to use our tongues to speak for the upbuilding of others and to spread the good news to our neighbors. Help us to offer our hands and our feet–and our time and our treasure–for the work of this congregation. Give us a spirit of love and unity and purpose as your church. Bless our homes. Forgive our sins. Renew our zeal for the gospel. Sanctify us in the truth. Your word is truth. To you be the glory. For Jesus’ sake. Amen. If we do that, sanctification will come without our ever noticing it. Energetically reach sustainable worship plans.